Businesses need to retain the sustainability of the operations to ensure that all the stakeholders of the company will remain loyal when it comes to supporting the needs and demands of the business operations. Having a business is a hard task to do as it requires full attention especially when it comes to identifying the loopholes that can negatively affect the business. If you want to be more knowledgeable of the corporate qualities and characteristics of your business, you have to develop a strengths and weaknesses worksheet that can fully discuss the entirety of your business brand. Not all corporate entities have a strengths and weaknesses worksheet. This is due to the reason that business operations vary from one industry to another. More so, the scale of operations and the market reach of the business can both affect the decision of the management to either have a worksheet specifying the company’s strengths and weaknesses or not. With this in mind, we still think that having a general worksheet with the specified nature is necessary as it can guide the business in decision-making processes that can further improve the image and operations of the company. The completion of the details found in a strengths and weaknesses worksheet is what can make it truly effective. If you want your strengths and weaknesses worksheet to be highly usable, the first thing that you need to accomplish is to make the document detailed and comprehensive. You also have to keep in mind that this document should be updated from time to time to ensure the efficiency and credibility of its content especially when it comes to the professional development and implementation of the call to actions, varying on the result of the strengths and weaknesses listing. You may also check out our related articles Word Problem Worksheets and SWOT Analysis Samples. It ensures the business that there is a reliable foundation in relation to the development of new programs, specifically made to address the weaknesses of the company and to further strengthen the management and its operations. It serves as a guide for the business owners in terms of creating some decisions that can change the listing present in the worksheet. It can be used as a reference when the strengths and weaknesses comparison is necessary to identify the growth of the company as a corporate entity. It lists down findings coming from different sources which make it easier to assess particular activities affecting specific stakeholders and their perception of the business. You may also checkout our related articles Order of Operations Worksheets and Place Value Worksheets. You may also see percents worksheets. 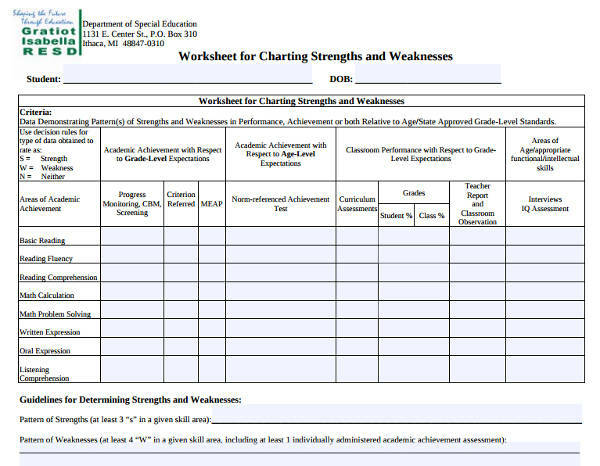 A strengths and weaknesses worksheet is not an easy document to accomplish. You have to be aware of the sources where you will get your information and you will also have to develop a format that can make the content of the worksheet understandable. If you are having a hard time in making a strengths and weaknesses worksheet, here are some of the tips that can make the entire procedure easier for you. You may also see time worksheet samples. Make the worksheet precise and direct to the point of the strengths and weaknesses of the business to be highlighted. Gather information in a measurable and attainable manner to ensure the effectiveness of data gathered. Develop a layout that can specify the strengths and weaknesses of the company based on the presentation required by the management. Have an objective when creating the worksheet so you can be guided on what specifically to present. Ensure the organization of information to make the document desirable to be browsed through. Coming up with a strengths and weaknesses worksheet is a decision that the management of the business should be serious about. If you have a strengths and weaknesses worksheet at hand, the company can be directed in a corporate path that is beneficial and advantageous to the employees, customers, or clients, and other stakeholders of the business. The development of a strengths and weaknesses worksheet must be done in a timely manner in order for its full effect to be realized. 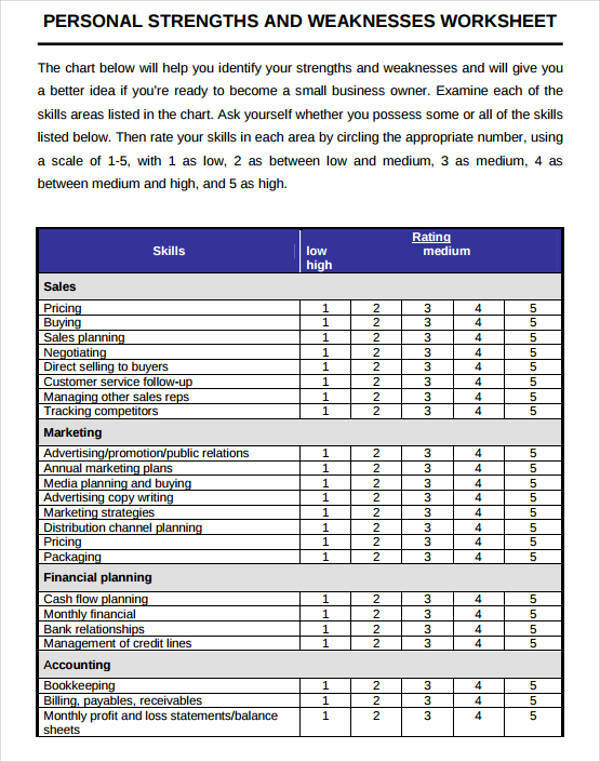 Here are some instances where it is recommended to come up with a strengths and weaknesses worksheet for your business. You may also like accounting worksheet templates. 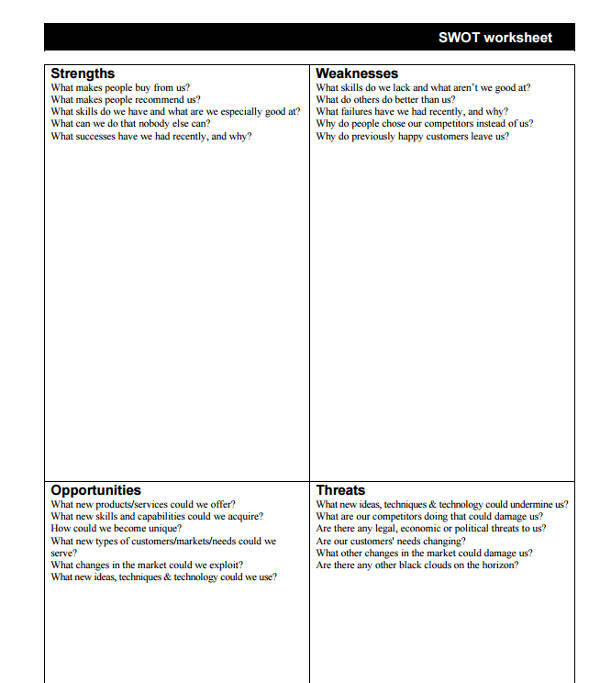 Should I Invest in a Strengths and Weaknesses Worksheet? With the specifications that we have discussed in this article, you may already have the impression that creating a strengths and weaknesses worksheet is a tedious corporate task. It requires the involvement of various stakeholders and it also demands and requests the time, effort, and somehow finances of the business. With all the factors that are needed to be balanced, it is essential for a strengths and weaknesses worksheet to be done in a formal and professional manner for the sources and resources used not be put to waste. You may also see budget worksheets. Since you are already guided by tips, steps, and guidelines from this post, you can already create a strengths and weaknesses worksheet on your own. Make sure to remember the essence of the discussion so that you can create a document that you can use to its greatest potential. You may also like statistics worksheets.